Editor’s Note: What follows is an abridged version of an essay that ran in Energy & Resources Digest. This free e-letter focuses on the latest opportunities in oil, alternative energy and commodities. To learn more, click here. Every four years, the American Society of Civil Engineers grades America’s infrastructure. In 2013, America’s grade was a D+. The estimated cost to improve our roads, bridges and sewer systems? $3.6 trillion. 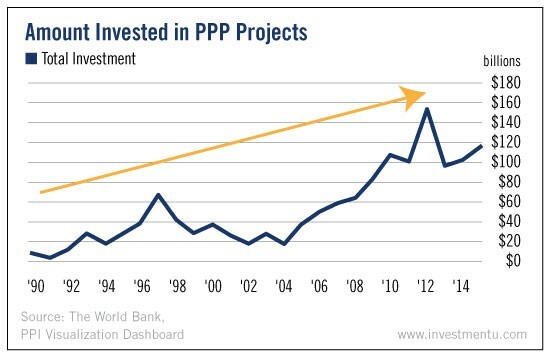 As you can see in this week’s chart, the amount of money invested in PPP projects has increased 1,365% over the last 25 years. And the number of PPP projects has increased 705%. It will only grow from here, which means big bucks for certain investors. You see, PPPs are deals in which the public sector contracts a private company to design, build and maintain large-scale infrastructure assets. You may be wondering: If the private parties are taking on the majority of the risk, what’s in it for them? Often, the private company collects a recurring payment based on the condition of the project. In some cases, the government even allows the company to collect tolls or fees generated from it. Because these partnerships are so mutually beneficial, PPPs could ultimately be the answer to America’s $3.6 trillion infrastructure problem. One way for you to invest is through municipal bonds called Private Activity Bonds. So far, they’ve been used to finance more than $10 billion worth of roads, tunnels and bridges. Another play that our Energy and Infrastructure Strategist David Fessler has covered is The VanEck Vectors High Income Infrastructure MLP (NYSE: YMLI). According to Dave, it has a complete focus on U.S. infrastructure. It also pays a sizable dividend yield of 7.32%. A bet on this specialized MLP is a bet that infrastructure spending will rise over the coming years. The good news for investors (and drivers)? One thing our presidential candidates actually agree on is a need for improved infrastructure.